Whether or not economic times are tough, it's always good to have a bunch of frugal recipes in your cooking repertoire. We're of the mindset that (and you probably feel the same too), that keeping more pennies in our hands and less of them paid to other people is a good thing. Not a bad idea right! Frugal recipes like these help you keep more of your hard-earned money in your own two hands. Check out the frugal recipes we've gathered for you here. From soups, to casserole recipes, dessert recipes and pasta dishes; there are plenty of ideas for a couple weeks' worth of cooking. Each of these frugal recipes costs less than $1.50 per serving. Now THAT makes good "cents." Southern Style Baked Macaroni and Cheese — $.99 per serving - Pasta recipes like this are worth more than a buck, but we're happy we don't have to pay more! Ritz Cracker Eggplant Casserole — $.94 per serving - This casserole dish is one of our favorite frugal recipes. Tomato-Macaroni Salad — $1.41 per serving - This dish is cheap and super easy to make. Venetian Chicken — $.81 per serving - You won't believe such a tasty chicken can be this cheap per serving. Potato Leek Soup — $1.28 per serving - We can never get enough potato soup, and this one will have you adding it to your favorite list for frugal recipes. Ranger Oatmeal Cookies — $.68 per serving - Oatmeal cookie recipes are classic, they're the perfect cheap snack to take along in your boxed lunch. Garlic Cheese Biscuits — $.37 per serving - We still can't believe how inexpensive these savory cheese biscuits are. Bacon Cheeseburger Upside Down Pizza — $1.43 per serving - Your family will go wild for this awesome pizza dish. Crunchy Tuna Casserole — $.50 per serving - A classic casserole recipe that kids have been loving for as long as we can remember. Black Bottom Cupcakes — $.45 per serving - When you're in need of a bunch of cupcakes for an outing, these are the most frugal friendly. NEW Dollar Store Kickin' Chili — $.80 per serving - Easy and cheap? We a great cheap meal that will keep you warm! 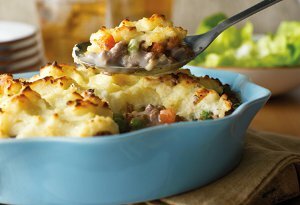 NEW The Fastest Shepherd's Pie — $1.50 per serving - A super fast dish that is great for a weeknight meal. For even more frugal recipes that are a must-have for any family check out this Frugal Recipes: 26 Easy Ground Beef Recipes for Dinner" eCookbook.